The Blue Devils won Thursday night's Drum Corps International Quarterfinals show in the first match up since the DCI Southwestern Championship in San Antonio on July 21 where 21 Division I corps competed. Losing to the Cadets in their last two scheduled competitions during the regular season, the Blue Devils' performance of their 2007 production, "Winged Victory," scored an uncontested 97.200 during the Quarterfinals on Thursday. "I thought the members were on fire tonight; they had a great show," said Blue Devils percussion staff member Ben Maughmer. "There are a lot of great drum corps this season and it's been close all year long [competitively]. It's exciting to see the audience respond to everybody out there." 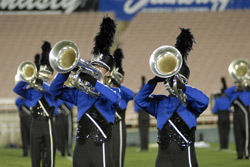 The Cadets' "This I Believe" scored a 96.5, after a two-point penalty was removed. The penalty was originally assessed after a request from Cadets Director George Hopkins that the field be relined before his corps performed. The Cadets retook the field after the hash marks were relined and performed their complete production. The corps was originally penalized 2.0 points, the maximum possible penalty for a delay of show. Hopkins successfully protested the penalty in a lengthy post-show conference. "Tonight's show was very good for the first of the Championship shows and in the next two days you will see more growth from our corps," said Cadets Drum Major Chris Castille. "You'll see us come out with a new fire tomorrow and we will improve upon [our performance] tonight. I promise that you will definitely see what you would expect to see from the Cadets." Drum Corps International has scheduled additional breaks during the Division I Semifinals Friday in order to reline the field. In addition, the Cadets will perform second-to-last after the Cavaliers, rather than fourth-to-last after Phantom Regiment as was announced after the show, to reflect the updated score. Cavaliers scored 96.225 for third place and Phantom Regiment scored 94.600 for fourth. The Cadets, the Cavaliers and Blue Devils have kept a tight race for the first three places throughout the second half of the season. Likewise, the Bluecoats (93.700, 5th), Carolina Crown (93.325, 6th), and Santa Clara Vanguard (93.200, 7th) are tightly contesting the race for the top six corps. Rounding out the top 12 are Blue Knights (90.200), Boston Crusaders (89.350), Glassmen (87.175), Colts (87.075), and Spirit from JSU (85.925). The Academy remains with striking distance of a top-12 finish at 84.975. Blue Stars (84.200), Madison Scouts (82.5), Crossmen (82.425), and Pacific Crest (80.750) will also perform at Friday night's Semifinals show. Ending their season tonight were the Seattle Cascades (80.100), Southwind (77.950), Troopers (77.550), Mandarins (75.200) and Pioneer (73.325).